Three wins from four races at the start of a Formula 1 season is a stand-out achievement in anyone's book, but one that is far more common than you might think. In the 65 F1 seasons completed to date, a driver has enjoyed at least that level of dominance in 22 of them. That number rose to 23 with Lewis Hamilton's victory in Bahrain on Sunday. It's fair to say that drivers who rattle off a 75% success rate over the first four races usually go on to win the world title. Three men share the ignominy of failing to land the title after winning three from four at the start of the season, and - Hamilton be warned - they are among the best drivers the sport has ever seen. Lotus driver Emerson Fittipaldi's world-title defence in 1973 began brilliantly with wins in Argentina and on home soil in Brazil. Jackie Stewart won in the next round in South Africa but Fittipaldi returned to the top of the podium in round four in Spain to increase his championship lead. But that was as good as it got for Fittipaldi. He managed four more podiums over the next 11 races, but a trio of costly retirements midway through the season ensured he ended the year 16 points adrift of champion Stewart. Curiously enough, the next time a driver won three out of four races at the start of a season provides the second example of a driver who failed to deliver on his early-season promise. Although in defence of Alain Prost, 1988 was no ordinary F1 season. In that year, his McLaren team were the absolute class of the field and in Ayrton Senna the Frenchman had arguably the greatest driver of all time for a team-mate. McLaren won 15 out of 16 races in 1988 - eight wins going to Senna and seven to Prost. Prost outscored Senna by 105 points to 94 across 16 races, but owing to a rule that didn't make a lot of sense then and makes even less now, only a driver's best 11 results counted towards the final tally. Once the calculators had been put away, Senna was champion by three points from Prost. The 1989 season is one of the most famous in the history of the sport. It was the year that the Senna-Prost relationship truly came crashing down, with the climax coming in their acrimonious clash at the Japanese Grand Prix. Despite simmering tensions in the McLaren camp, the season had begun at something of a canter for Senna, who recovered from a poor first race in Brazil to win three straight in San Marino, Monaco and Mexico. Prost, however, was always in touch and picked up points at a steady rate. Although he won just four races to Senna's six that year, greater reliability ensured him a third world title by 16 points from his Brazilian team-mate - but only after Senna's controversial disqualification in the wake of their infamous Suzuka collision. The examples above stand as cautionary tales no doubt, but if truth be told Hamilton has every reason to be extremely confident about his chances of securing a third world title come the end of the year. Italy's Alberto Ascari won three of the first four races, excluding the anomalous Indy 500, in each of his title-winning seasons in 1952 and 1953, while Juan Manuel Fangio did likewise for three of his five world titles (1954, 1955 and 1957). 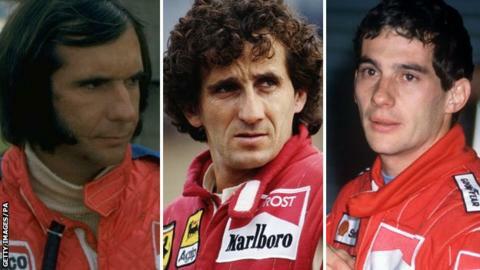 Jim Clark (1963 and 1965), Stewart (1969), Senna (1991) and Nigel Mansell (1992) achieved the feat, as did Michael Schumacher on no fewer than four occasions (1994, 2000, 2002 and 2004). You can add Damon Hill (1996), Fernando Alonso (2005), Jenson Button (2009) and Sebastian Vettel (2011) into the mix. Oh yes. Some guy named Lewis Hamilton managed it last year too.